Iiwi, the magnificent scarlet Hawaiian Honeycreeper with the stunning down-curved bill usually found at high elevations (like the almost 7,000 ft Hosmer Grove in Haleakala National Park) has recently been spotted at lower elevations in several upcountry residential neighborhoods. These birds can be susceptible to avian malaria, which usually keeps them active at elevations above mosquito habitat. Reports of Iiwi sightings in Makawao prompted Maui Forest Bird Recovery Project (MFBRP) to take action by planting native vegetation in lower elevation degraded areas. This effort will help create “island habitats” for the Iiwi which can help facilitate movement This wonderful non profit group has done and continues to do so much work to help protect native bird and plant species. They are a committed group of incredibly passionate workers. A lot of their time is spent camping for days in minimalist fashion in remote untamed high elevation areas. -And most of the time it’s under harsh weather conditions. I respect and applaud them every day. I was lucky enough to join them in a volunteer planting effort recently and was immediately impressed by the group size. 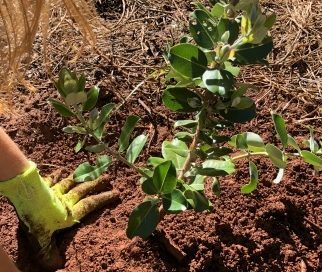 It made me happy beyond words to see so many people willing to lend their personal time to planting native vegetation. Parents, children and bird enthusiasts of all kinds showed up. The work we accomplished as a group in just four hours was amazing! Chris Warren, a biologist with MFBRP instructed everyone on how to plant for success. By packing the soil down tightly and eliminating root exposure to the air the plants have a much higher likelihood for survival. He demonstrated proper planting techniques and we went to town planting Mamane, Koa, A ali I, Kupu Kupu and Ala he’e, all native plants of Hawaii. It was a truly wonderful day…We planted everything and then stepped back and instantly could see how much we had actually accomplished. These types of volunteer events are what helps keep Maui the magical place that it is. -People coming together to make our world a better place, for the birds, for the keiki, for the future. Thank you Maui Forest Bird Recovery Project. If you find yourself on Maui with a little bit of time on your hands, I highly encourage you to reach out to see how you can lend a hand in protecting this island. -Just a little bit of volunteer work can really go a long way.